Red Bull Rising: Welcome to Shelbistan! The last time I was in Camp Shelby, Miss., I was brand-spanking new to the Iowa Army National Guard. I was part of an entire battalion of communications soldiers who had descended up on this place like locusts, wave after wave after wave. There wasn't much physical damage that was left to be done to the post, of course, because Hurricane Andrew had recently blown through the American South, and the post was being used as emergency housing. Many of the cinder-block buildings were so moldy and wet, soldiers asked whether the hurricane had actually passed over this part of Mississippi. We preferred living and working in our tents. In those days, units still got a 24-hour pass during their 2-week Annual Training periods. One "Retention-Day" busload went to Gulfport, Miss. The other went to New Orleans.
! "), and almost getting kicked out of a country karaoke bar with your first sergeant, because he wanted to sing "All My Exes Live in Texas" once too many times. I had to carry one of my buddies into a taxi cab--held his head out the window like a drunken puppy--in order to get him back to the hotel. Just recently, I was interviewed for his pre-deployment security clearance. What goes on in the Big Easy, stays in the Big Easy. There's a beauty and charm to the American South that's easy for a flat-lander like me to forget. To appreciate it, you have to not mind getting sticky. And developed a tolerance for exotic and pungent smells. To this day, I can still remember the full-on nasal assault of a New Orleans dumpster. Laissez les bon temps rouler! You gotta take the bad, after all, if you want the good. You can't have Mardi Gras, if you don't have Lent. You can't have the deployment, without the mobilization station. 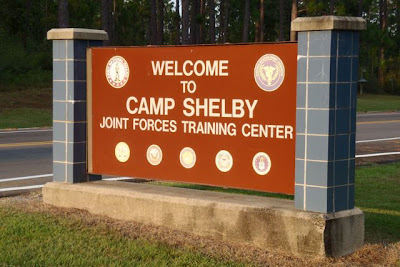 Camp Shelby is the largest state-owned training site in the United States, comprising more than 525 square kilometers. and has served as a training and mobilization station for units in World War II, Vietnam, and Operations Iraqi Freedom (OIF) and Enduring Freedom (OEF), as well as others. A series of stones on the grounds of the Mississippi Armed Forces Museum memorializes some of the units that have gone before. The 1st Brigade Combat Team, 34th Infantry Division (1-34th B.C.T.) came through here at least once before, prior to deploying to Iraq in 2005. The 2-34th BCT's own 1st Battalion, 133rd Infantry Regiment (1-133 INF)--the "Ironman" Battalion--was one of those units. 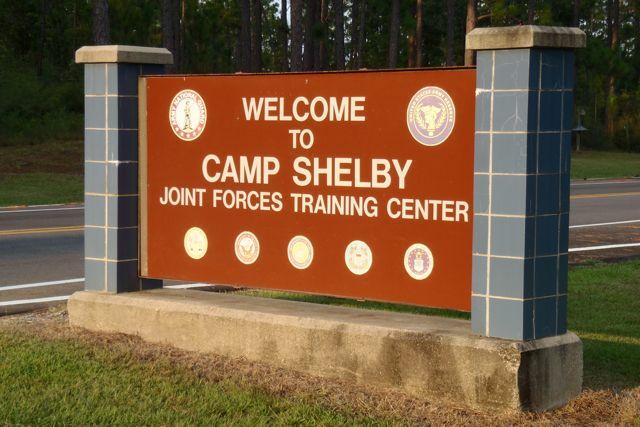 There's apparently been a lot of construction on Camp Shelby in the past 20 years. The Post Exchange (P.X.) --a military equivalent of a truck stop store, or a convenience mart on steroids--is undergoing an expansion and renovation. At the PX, soldiers can buy snacks and DVDs and pocket knives. They're not allowed to purchase or consume alcohol at any time, even the the PX has some of that, too. There are some food vendors parked in trailers outside the PX, allowing soldiers to replace (at their own expenses) their M.R.E. lunches with pizza and pork fritters and burritos and catfish. Ah, life on the FOB! I haven't yet gotten a chance to visit the on-post museum, but I note that, in World War II, German prisoners-of-war (P.O.W.) from the North African campaign were housed at Camp Shelby. I seem to recall that POWs were required to be housed in environmental conditions similar to that of their points of capture. In matching the misery and heat of the North African desert, Camp Shelby apparently fit the bill. I don't know if you are aware, but the 1-134 Cavalry, then known as the 1-167 Cavalry, deployed with First Brigade along side the 1-133, including the lovely sojourn to Camp Swampy. You're right--I hadn't yet made the connection between the 1-167 and the 1-134 CAV. Looks like I'm going to have to dust off some history books, maybe do some quick "bios" on each of the units deploying. Thanks for the info! And ... stay cool? I did some training in Camp Shelby with the Illinois National Guard, the 133d Signal Battalion. That was back in the early 90s. Happy 93rd Birthday, Red Bull!